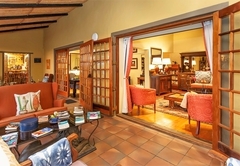 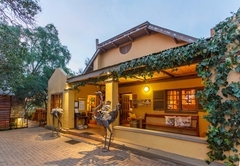 Riverside Guest Lodge is one of the Oudtshoorn guest houses and provides accommodation in 6 guest rooms for tourists visiting the Karoo region. 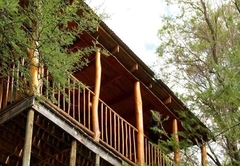 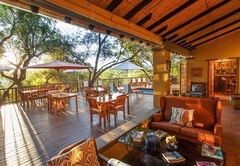 Located on the banks of the Grobbelaars River and just 2.7kms from the Cango Wildlife Ranch, Riverside Guest Lodge offers bed and breakfast and self catering accommodation. 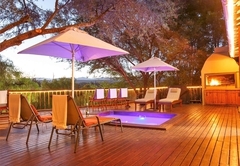 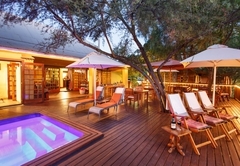 The lodge has an outdoor pool on a wooden deck with views of the Swartberg Mountains as well as the Grobbelaars River below. 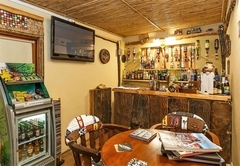 Guests can enjoy a drink at the on site pool side bar. 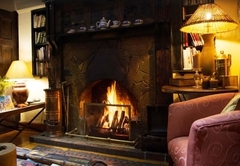 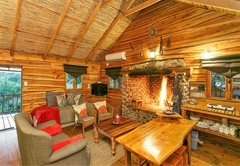 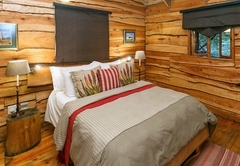 The lodge features individually decorated rooms and artist inspired log cottages. 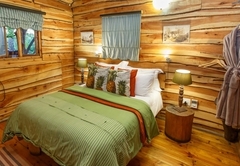 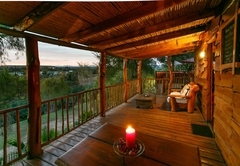 All rooms and log cottages are air-conditioned and have flat screen TV's with DStv. 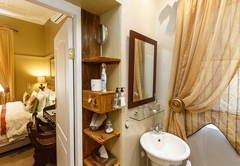 All have private bathrooms with free toiletries and a hair dryer. 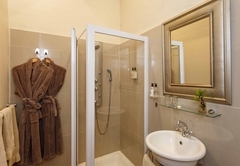 Towels and bathrobes are provided. 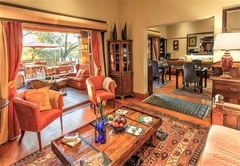 Free Wi-Fi is offered throughout the property and there is ample off street secure parking for vehicles. 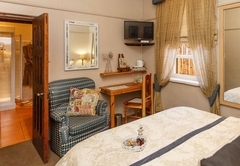 The cottages sleep five guests each and have self catering facilities. 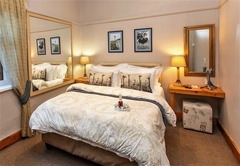 This en-suite room is furnished with a Queen-size bed. 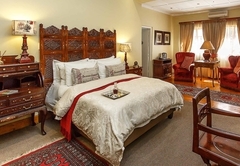 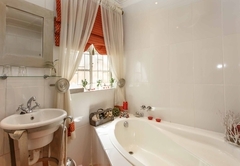 The comfortably furnished room has a Queen-size bed and an en-suite bathroom. 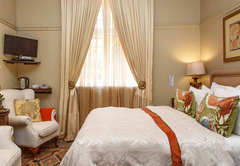 Perfect for budget conscious travelers the room has a Queen-size bed. 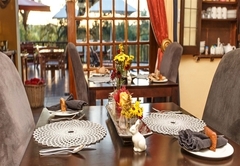 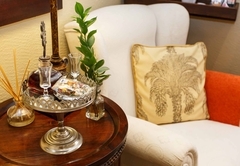 A full cold buffet as well as a hot cooked to order breakfast is included in the room rate. 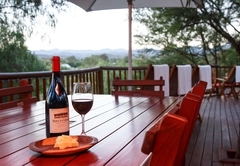 Breakfast is optional in the self catering log cottages at an additional charge per person. 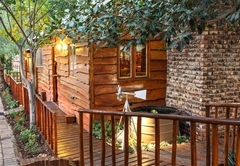 Built by an artist wood cabin builder they sleep 5 guests each, overlook the Grobbelaars rivier and are within walking distance to the town centre. 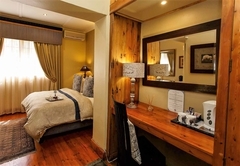 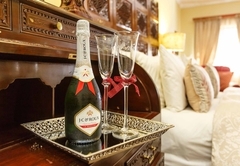 Our air-conditioned en-suite rooms are furnished with queen size beds and all necessities. 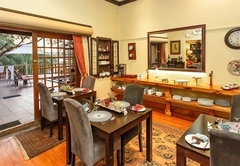 Hair dryer, Wi-Fi, tea & coffee making facilities. 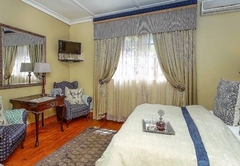 TV with DSTV. 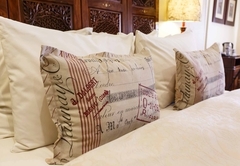 Linen, bath robes and towels are provided. 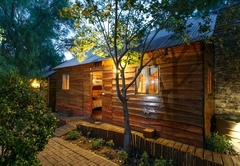 Response timeRiverside Guest Lodge typically responds to requests in 5-10 minutes.